“There are actually 10 people looking at the camera. We’d be nuts not to buy this,” said one of my daughters-in-law. 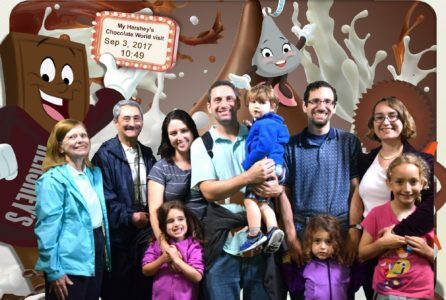 Our entourage of four children ranging in age from 2 ½ to 7 and six adults had just exited the free Chocolate Tour, housed in Hershey’s Chocolate World in the eponymous Pennsylvania town with its Kisses-shaped street lights and the aroma of chocolate — whether actual or imaginary — permeating the air. One of the greatest satisfactions of my parenting has been that my sons, 3 ½ years apart in age, grew up as friends. As adults, they remain close. Despite living 350 miles apart, they make sure they and their families get together several times a year. For the last few years, that has included a mini-vacation. The continuously moving line for the Chocolate Tour takes visitors past displays on the history of Hershey’s on their way to colorful cocoa bean-shaped amusement-ride cars. The line stops only once: for ride-takers to have their photo snapped. Then, safely ensconced in the ride’s cars, it’s through a tunnel of singing cows and dancing chocolate bars narrating visitors’ senses-filled ride depicting the transformation from cocoa bean to chocolate bar, ending with a sample Hershey Nugget. The photo sales pitch came just before we exited the ride area — into the gift and candy emporium, naturally. Agreeing with our daughter-in-law’s assessment, for $20 we purchased one print and online access to the same pose with several other backgrounds photo-shopped in. None of us had really wanted to be photographed and it certainly isn’t the greatest of photos. 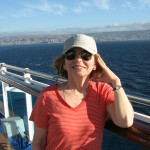 Over the years, my husband and I have become rather adept at avoiding these increasingly ubiquitous photo ops, whether on cruise ships or at tourist sites. But somehow, it just seemed easier to spend the few seconds to have our photo snapped than to hustle the 10 of us past the effusive photographers. I’m not sure any one of us looks really great, but we are all facing forward. More importantly, we’re all in it. I don’t think we have another photo where that’s true. Like all photos, it captures a moment in time. And that’s just the point. Photos are the visual shorthand of our memories. More than 30 years ago, my husband and I stopped at Hershey with our sons, then 6 and 3, and took a less special-effect version of the same ride. 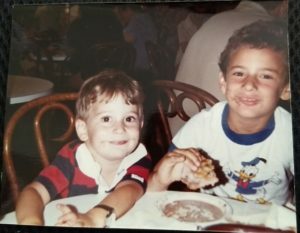 No quasi-professional photos that time — just the snapshot we grabbed of our boys enjoying a snack in the much less developed food court. That photo has been part of a collage of vacation pictures that has hung in our family room for years. My husband and I looked at it shortly before our latest Hershey trip. The photo flooded us with memories. We had come to Hershey on our way back to our then-home in Massachusetts from a visit to my own brother and his family in Michigan. After Hershey, we visited Sesame Place. That recollection reminded us of the time we accompanied our grandchild Miriam to a Sesame Live! show when she was just a toddler. The show both delighted and frightened her and she talked about it for weeks afterward. 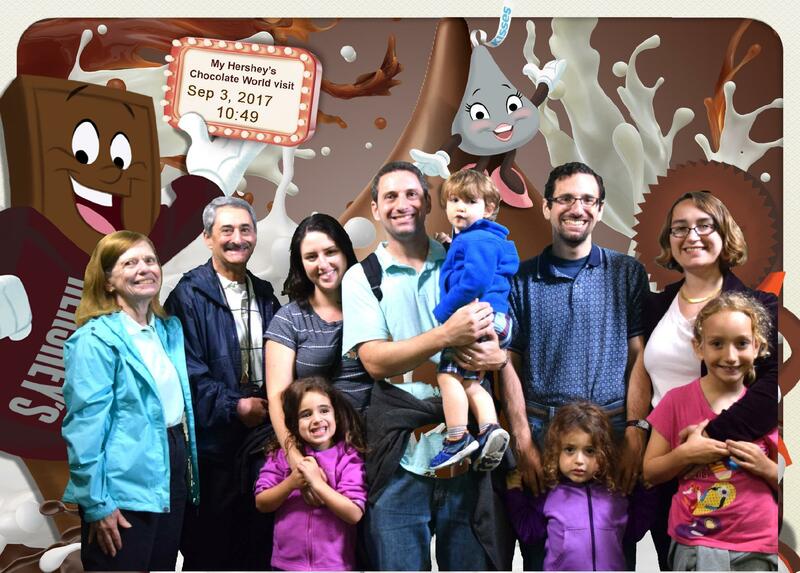 Our new Hershey photo will hold its own share of memories. Bottled up in this moment of time is a whole day of activities. Miriam’s joy cramming as much candy as possible into her $7.95 plastic baggie. Aaron thrilled with the little Hershey’s truck his aunt bought him. Rayna and Josie wide-eyed at all the stuff that surrounded them. Beyond the computer-generated background of the photo lies the magnificent Hershey Gardens where all four grandkids played among the Kisses-shaped sprinklers that erupted randomly, collaborated to put on an impromptu show in the children’s amphitheater and with us adults, gaped wide-eyed at the array of butterflies in the atrium. We have other photos from that day, of course, the ones we took ourselves. And they all tie us to images of that and other days. But the one with the 10 of us facing the camera is the sweetest of all.